We’re back, and still counting down moments from Shattered Grid. It’s 25 Morphinominal Moments for 25 years of Mighty Morphin Power Rangers! Go Go Power Rangers maintained an interesting balancing act during Shattered Grid. 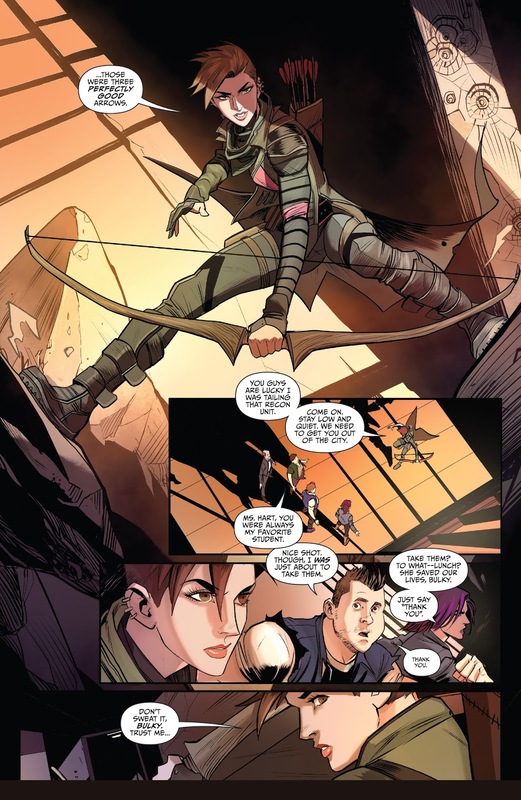 It had to continue doing its own thing, while also introducing us to the Ranger Slayer, and giving her a story that ties into the event overall. Of course, the Ranger Slayer is the older Kimberly counterpart from Lord Drakkon’s universe. This take on Kimberly definitely has a Katniss Everdeen vibe going for her. She gets a strong introduction too, complete with a couple of oddly humorous lines from Miss Appleby. Mora re-uses this same action pose later in the issue when we see her in morphed form. I mean, we’ve got two Kimberlys. At that point, you can’t not have a hair joke, right? At least she made herself laugh. Zeo has been surprisingly underrepresented in the BOOM! books. Luckily that will be rectified a bit once Marguerite Bennett and our new creative team take over. But MMPR Annual 2018 was the first time we’d seen the Zeo covered by Kyle Higgins and the crew. 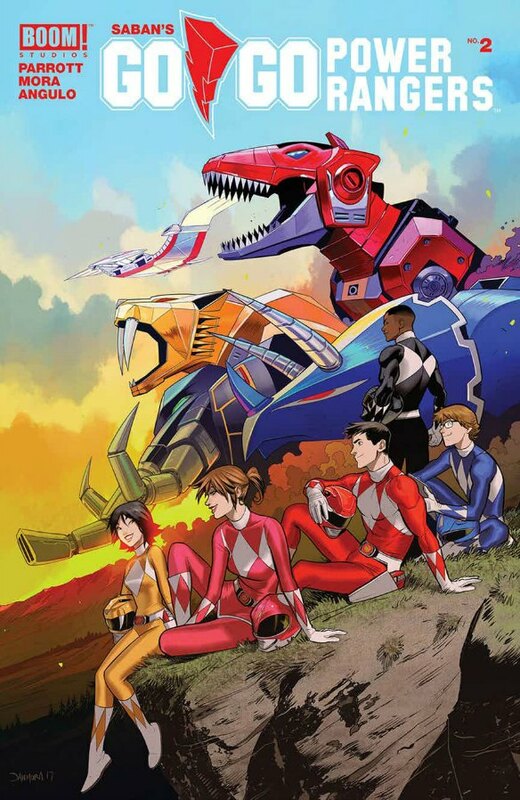 Drawn by Marcus To, the story shows us the team’s farewell party for Jason after he loses the Gold Ranger powers. But amidst it all is a great little scene between Tommy and Jason on top of the Command Center. They reminisce about old times, and Jason talks about how good it was to be a Ranger again, if only for a short time. Of course, there’s a big swerve near the end. But I adore the idea. Scenes like this are a big part of what makes this BOOM! Studios MMPR run so great. One of the highlights of Kyle Higgins’ work in the PR universe was MMPR #15, a Zordon-focused issue, following everybody’s favorite blue head in a tube as he travels through a dimensional rift and meets his counterpart from Lord Drakkon’s universe. In the MMPR special that came out on Free Comic Book Day, Higgins once again got to play around with Zordon. This time with co-author Ryan Parrott, and illustrator Diego Galindo. As the conflict with Drakkon continues to escalate, Zordon seemingly travels to an etherial plane of sorts to meet with three emissaries, in the hopes that they will ask the “Morphin Masters” (long story) to intervene. These emissaries take the shifting forms of various red, blue, and yellow rangers, which is fascinating. They’re seemingly speaking to Zordon from inside the Morphin Grid. So it makes a sort of sense that they would take on these familiar forms. While there’s certainly no need for us to see them again, I certainly wouldn’t mind another appearance from these emissaries, if not the Morphin Masters themselves. This entry was posted in Comic Books/Graphic Novels and tagged Blue Ranger, BOOM! 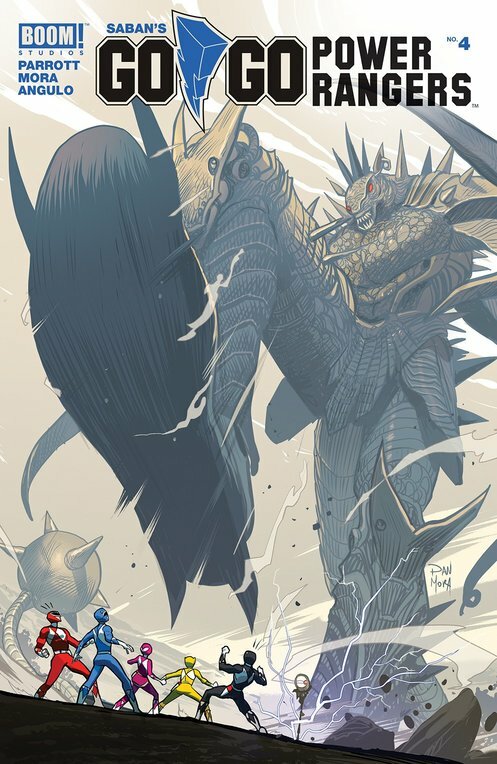 Studios, comic books, Dan Mora, Diego Galindo, Go Go Power Rangers, Go Go Power Rangers (BOOM! Studios), Jason Lee Scott, Kimberly Hart, Kyle Higgins, Lord Drakkon, Mighty Morphin Power Rangers, Mighty Morphin Power Rangers (BOOM! 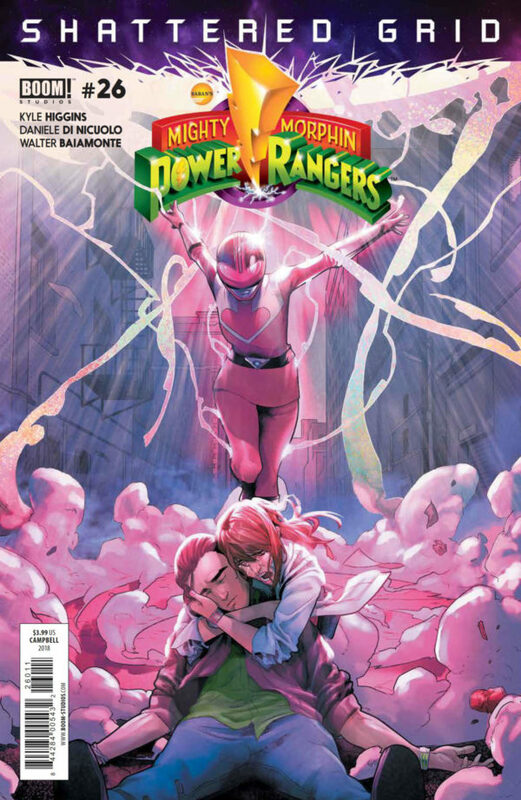 Studios), Mighty Morphin Power Rangers Annual 2018, Mighty Morphin Power Rangers: Shattered Grid, Miss Appleby, Pink Ranger, Pink Ranger costume, Power Rangers, Power Rangers Zeo, Ranger Slayer, Red Ranger, Rob Siebert, Ryan Parrott, Shattered Grid, Simona Di Gianfelice, superheroes, teenage superheroes, Tommy Oliver, Walter Baiamonte, Yellow Ranger, Zordon on 08/25/2018 by primaryignition. THE ISSUE: Part 2 of the “Shattered Grid” story arc, celebrating 25 years of Power Rangers. The cover harkens back to the finale of issue #25. Kimberly holds the body of Tommy Oliver, who has just been murdered by his evil doppleganger, Lord Drakkon. Meanwhile Jen Scotts, the Pink Time Force Ranger, has just arrived in their timeline. 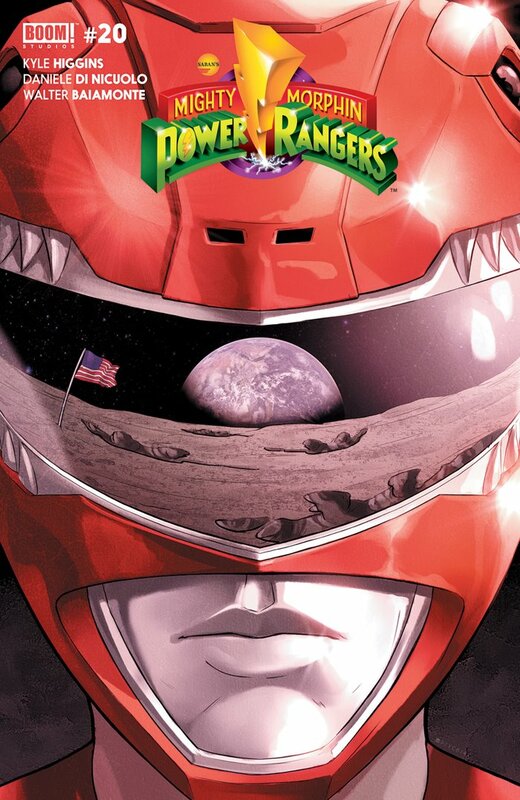 WHY IT’S EPIC: While this cover is pretty awesome on its own merits, it’s really only epic if you’re a Power Rangers geek like me. Tommy and Kimberly are both characters from the original version of the show, which hit the airwaves in 1993. Jen, however, is a character from the show’s 2001 incarnation, Power Rangers Time Force. While we’ve seen different Rangers from different seasons cross paths before (see “Forever Red,” “Once a Ranger,” “Legendary Battle,” etc), this interaction promises more depth, and much more personal stakes. Jen’s pose is very Power Rangers-esque, with the smoke added for effect. The different shades and intensities of pink really catch the eye. The way Tommy and Kim are positioned feels very natural, which isn’t always the case when you talk about these “grieving” poses. This one is somewhat evocative of the famous image from A Death in the Family of Batman cradling Jason Todd’s dead body. But MMPR #26 does enough to stand on its own in that regard. Campbell has done the majority of the covers for this series. They’re all very good. But this one has a special place among the bunch. This entry was posted in Comic Books/Graphic Novels, Epic Covers and tagged BOOM! 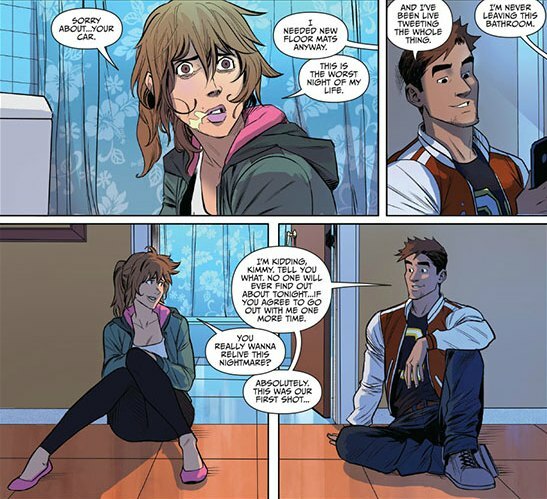 Studios, Jamal Campbell, Jen Scotts, Kimberly Hart, Lord Drakkon, Mighty Morphin Power Rangers, Mighty Morphin Power Rangers #25 (2018), Mighty Morphin Power Rangers #26 (2018), Mighty Morphin Power Rangers (BOOM! Studios), Mighty Morphin Power Rangers: Shattered Grid, Pink Ranger, Pink Ranger costume, Pink Time Force Ranger, Power Rangers Time Force, Shattered Grid, Tommy Oliver on 04/19/2018 by primaryignition. PENCILLERS: Daniele Di Nicuolo, Bachan. Cover by Jamal Campbell. 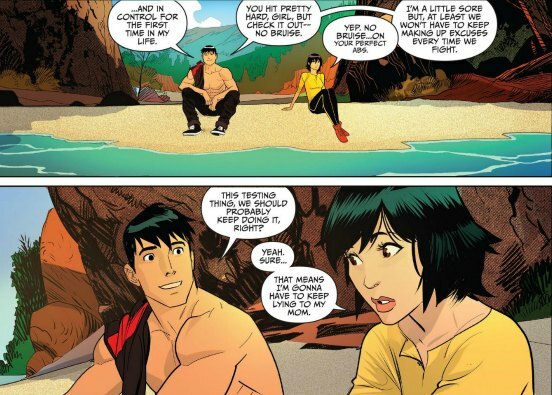 One thing you can’t take away from Mighty Morphin Power Rangers #20? It knows how the moon works. That’s not the moon we get here. This is the genuine article. How do we know? Because the issue opens with the moon landing in 1969. In true Power Rangers fashion, our astronauts accidentally unleash an alien threat. And so, decades before Jason and the others take up arms against Rita Repulsa, Zordon must choose a team of heroes to protect the Earth. They are Earth’s first Power Rangers, and their story isn’t quite as happy as that of their successors. I initially frowned upon the idea of Jason’s team not having the distinction of being the “original” Rangers of Earth. But transplanting the Power Rangers concept into the ’60s is too good an idea to pass up. It’s just a shame we don’t have time to flesh it out. Everything gets crammed into this one issue, and certain elements suffer as a result. Our leader and Red Ranger is Grace Sterling, whose older self we’ve met in previous issues. She’s a secretary at the PR equivalent of NASA, with dreams of going into space. At her side are a British rock musician, a Russian communist, a Vietnam War veteran, and an idealistic youngster. Obviously these characters are written to clash. The problem is making it believable and organic in such a short time. 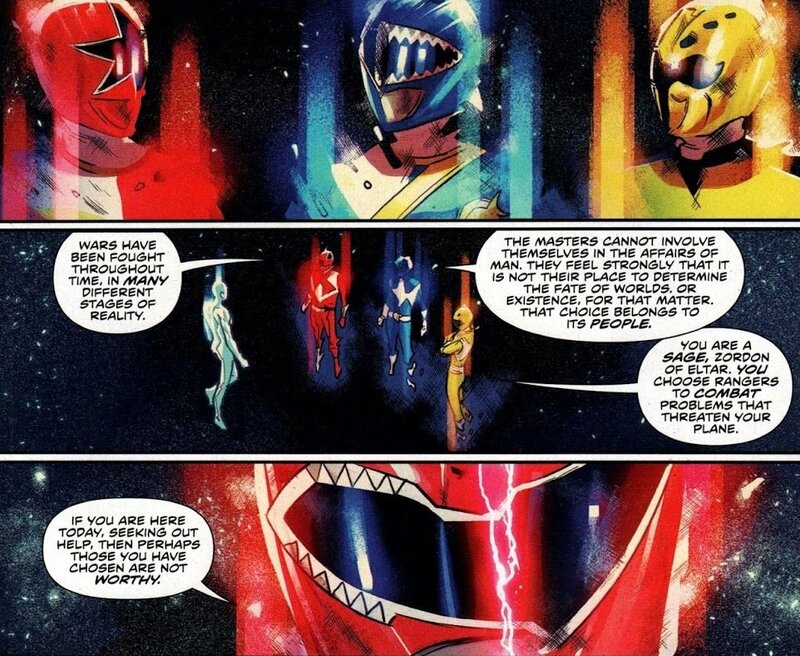 For instance, there’s an exchange between the Pink and Yellow Rangers about whether the war is right or wrong. But they’re on the moon! Plus, because we know so little about these people, and the conflict only lasts about two panels, it’s almost not even worth it. In a perfect world, giving this story three or four issues would have granted it much-needed breathing room. As this MMPR series has progressed, we’ve seen Kyle Higgins cherry pick elements and ideas from around the Power Rangers timeline. 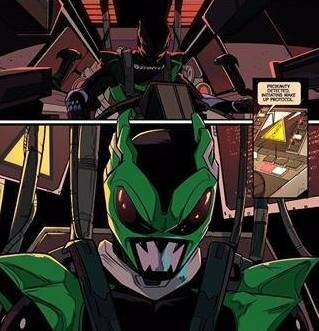 He does that here with the use of Psycho Green, a villain spinning out of the evil Psycho Ranger team from Power Rangers in Space. I’ve gotten on Higgins’ back for muddying the pre-established continuity, but this is harmless enough. It’s a nice little tribute to PRiS. Interestingly enough, Psycho Green is apparently the right hand to another PRiS villain, Dark Specter. 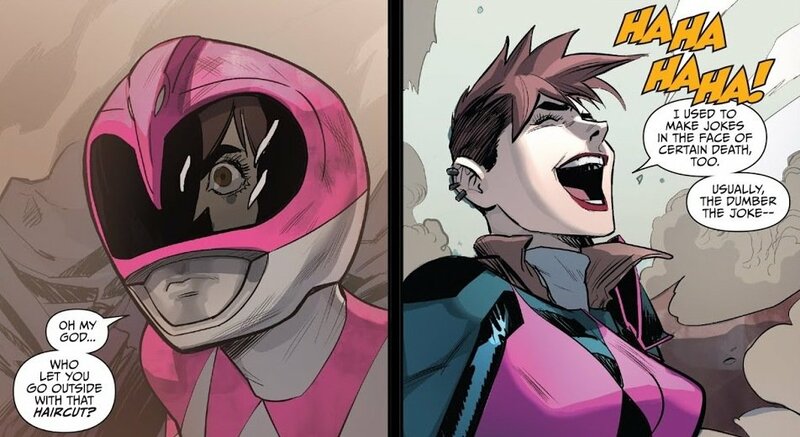 MMPR: Pink artist Daniele Di Nicuolo is back for this issue, and is also solicited for issue #21. 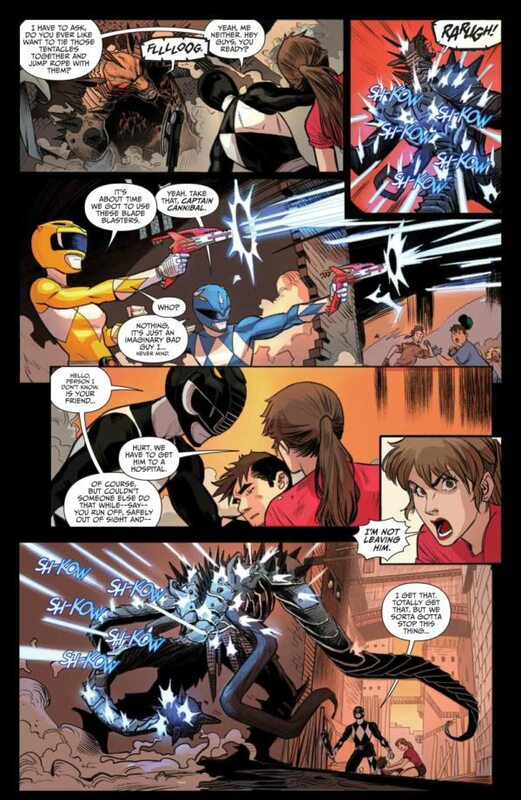 Di Nicuolo does well in the Power Rangers universe. But I was a little caught off guard by how jacked the male Rangers looked in morphed form. It’s fairly consistent with what he gave us in Pink. Maybe the alternate costumes distracted from it? Either way, Di Nicuolo draws an awesome Psycho Green. The gender swap element in this book is also interesting to look at. 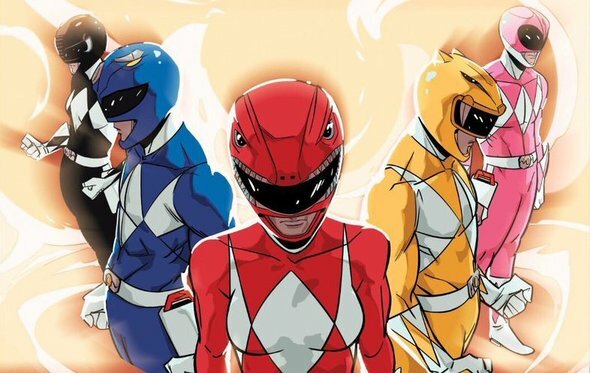 Our Red and Black rangers are women, while our Yellow and Pink Rangers are men. That’s a nice little twist on things. The scene with our five new Rangers in the Command Center is an issue highlight for me. Zordon has been absent for much of this series (the amazing issue #15 notwithstanding), so it’s great to spend a little time with him. It’s also the only time we get to see our unmorphed heroes interact with one another. Di Nicuolo gets to play with facial expressions, body language, etc. “The Ongoing Misadventures of Squatt and Baboo” continue as well. For whatever reason, I’ve found these a little more palatable than the Bulk and Skull stories we got in earlier issues. Squatt and Baboo fight the Megazord this issue, which goes about as well as you’d imagine. Considering how much hype MMPR #20 was given, not spending more time with this 1969 team seems like a wasted opportunity. Obviously what we saw here will factor into the coming issues, as Grace continues to interact with the Rangers. So in all fairness, we don’t have the whole story yet. But my immediate reaction is that they could have done so much more with this idea. But I’ll credit the BOOM! Studios crew for at least making it a reality. 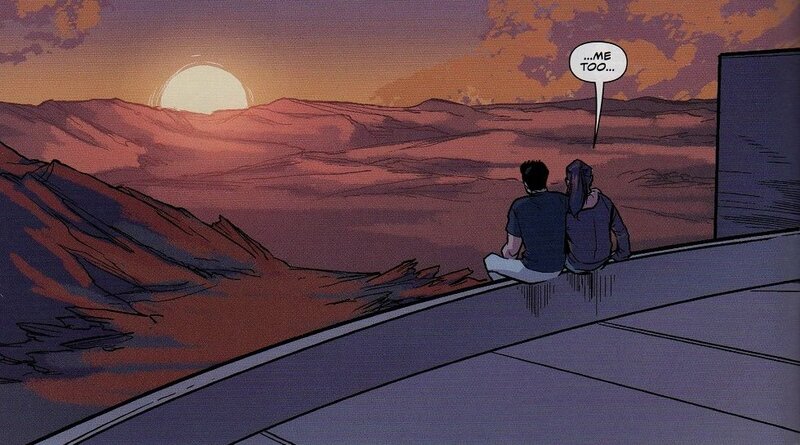 It’s a nice bit of world-building, in a series that’s already given so much to the Power Rangers mythos. This entry was posted in Comic Books/Graphic Novels and tagged Bachan, Black Ranger, Blue Ranger, BOOM! Studios, comic book reviews, comic books, Daniele Di Nicuolo, Forever Red, Jamal Campbell, Kyle Higgins, Megazord, Mighty Morphin Power Rangers, Mighty Morphin Power Rangers #20 (2017), Mighty Morphin Power Rangers (BOOM! Studios), moon landing, Pink Ranger, Power Rangers comics, Power Rangers costumes, Power Rangers in Space, Psycho Green, Psycho Rangers, Red Ranger, Rob Siebert, Ryan Ferrier, Squatt and Baboo, superhero comics, teenage superheroes, Vietnam War, Yellow Ranger, Zordon on 10/29/2017 by primaryignition.